Gray's Lake Bridge is located along the southern portion of the lake. 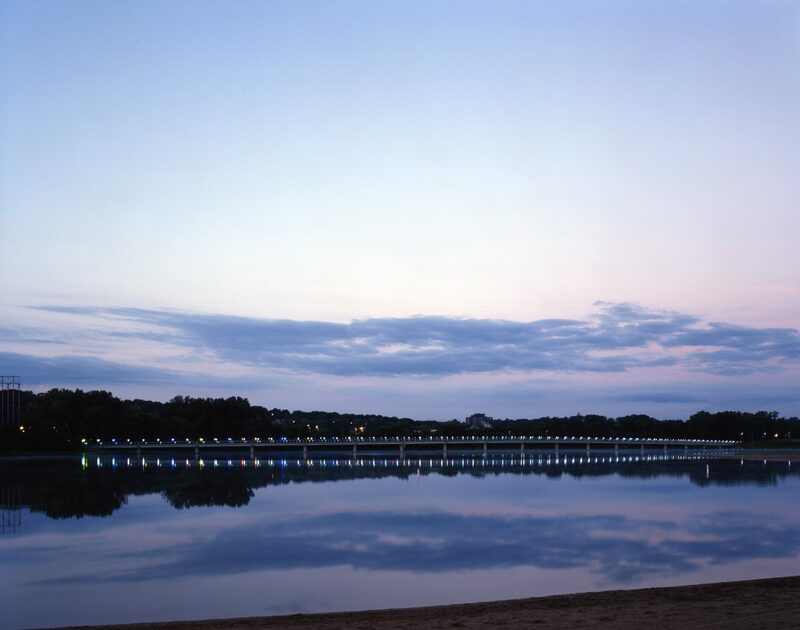 The 167-acre Gray's Lake Park is located in the heart of the City of Des Moines, at the site of a former gravel and sand excavation operation. The park is located on the southwestern edge of downtown Des Moines with entrances located on the east side of the major north/south arterial corridor of the City at 2101 Fleur Drive. 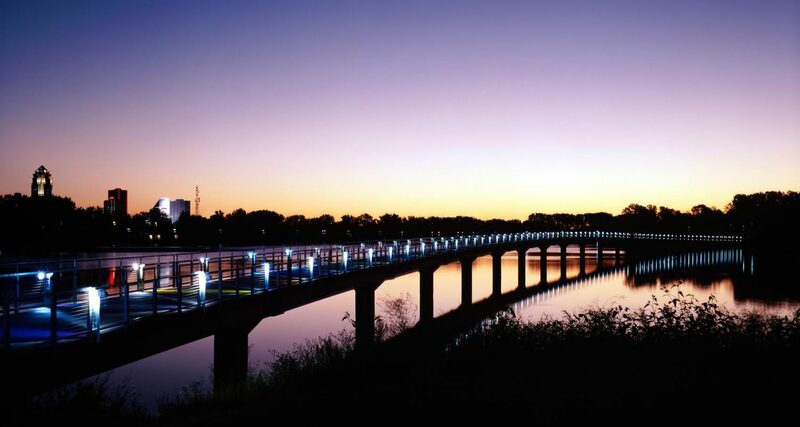 Located in Gray’s Lake Park, Gray’s Lake Bridge is an urban gem. After extensive renovations, the area opened as a City park in 2001. It has drawn people looking for a place of peaceful retreat and outdoor recreation and provides a beautiful gateway to downtown Des Moines. In 1998, David and Elizabeth Kruidenier came forward with a vision for Grays Lake Park and pledge of $1.5 million for a trail to be made around the lake. Construction deadlines on the Kruidenier gift encouraged city leaders to move at an accelerated pace. 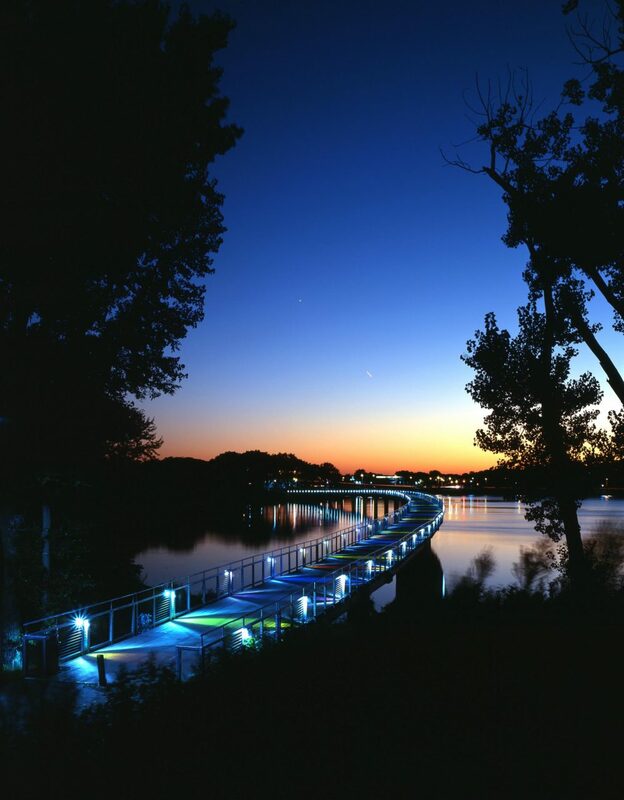 The City of Des Moines accepted financial gifts from Polk County, area businesses and private citizens, many of which were with the condition that the area be developed for public recreation. City officials and staff joined with citizens in planning, designing, building and funding the new Gray’s Lake Park. The project’s key philanthropist and influential civic leader and art patron, David Kruidenier was actively involved in the park design. During the design process, Kruidenier asked Professor Cal Lewis, founding principal of Herbert Lewis Kruse Blunck Architecture, to take on the design responsibility for the new bridge. Lewis led the bridge’s design process, was assisted by architectural intern Erin Olson-Douglas. Lewis also worked with RDG’s LA team [this group was the former LA firm of Crose Gardner that had completed earlier master plans for the project and had become part of RDG]. A design process quickly took shape and led to the bridge identity that exists today. 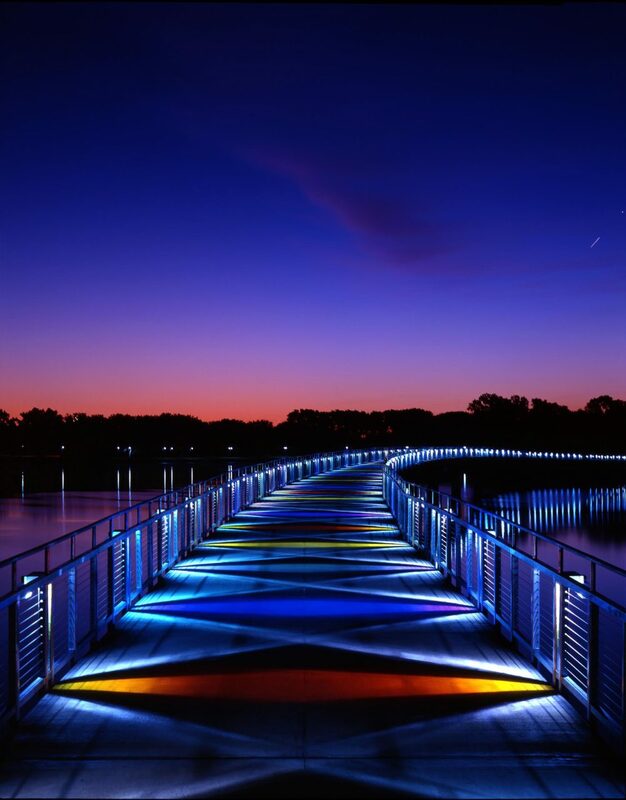 detail: Gray’s Lake Bridge design incorporated panels of multicolored dichroic glass that were dramatically backlit. To meet the limited civic budget, the new bridge structure needed to be very straightforward, so standard concrete bridge construction products and processes were incorporated. The bridge was to connect and highlight the proposed pedestrian pathway along the lake’s edge, forming a new two-mile loop to help enhance and activate the underutilized urban-edge site. The variety of visual perspectives revealed through both viewing and traversing the bridge was to maximize the impact of the on-site experience. 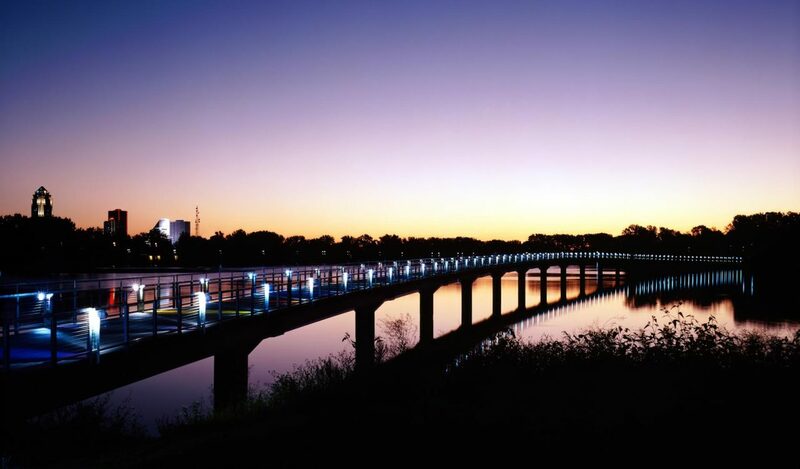 The bridge’s gentle curve served to unveil a panorama of pastoral vistas all along the extensive quarter-mile expanse, highlighted by the landmark view of the distant downtown skyline. The more artful portions of the project were expressed in the lighting concept. Small standard light fixtures were uniquely incorporated into the bridge guardrail construction to backlight intermittent dichroic glass panels. A dramatic diamond pattern of multicolored light radiated from the system of panels and fixtures, extending the lateral latticework of light all along the rainbow arc of the bridge’s walkway. The backlighting system also facilitated and animated the bridge’s nighttime identity from across the lake; the lights seem to twinkle as the viewer moves, while the multicolored reflections stretch down and shimmer across the rippling water below.